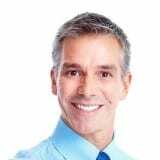 Our evidence-based eLearning courses are written and developed by experienced psychologists, online learning and development experts, and organisational and leadership specialists. The result? High quality and time efficient mental health and wellbeing eLearning courses for your organisation that are both impactful and effective. Our eLearning course contain the most up-to-date information and are innovatively designed to be highly engaging and interactive. View our full range of courses below. Is the course you are looking for not here? No problem, we custom build eLearning courses too. A comprehensive eLearning course for leaders to increase their awareness of mental health, proficiently manage mental health conditions in the workplace, and help reduce the stigma associated with mental health conditions. The course is designed to assist your organisation to meet its legal and moral obligations for managing mental health in the workplace. Executive, senior, frontline and emerging leaders and managers who have, or will have direct people leader/manager responsibilities. The purpose of this course is to provide your leaders with the knowledge, skills, and tools to recognise, and effectively manage and support employees in your organisation experiencing a mental health condition. The course content includes information to encourage helpful attitudes and behaviours towards employees with a mental health condition, improve mental health condition literacy, recognise the signs and symptoms of the most common mental health conditions, understand relevant roles and responsibilities including the law and mental health conditions, and how to have an effective conversation with someone experiencing a mental health condition. Please contact us to learn more about the content and learning objectives of this course. A 60 minute eLearning course containing interactive content and activities, animations, videos, and includes a comprehensive eToolkit containing additional resources for your organisation and leaders to use after completing the course. Each participant receives a digital certificate signed by a registered psychologist upon course completion. This course and eToolkit can be customised, translated and localised to your requirements. You may also be interested in our Mental Health Awareness – Employees and Mental Health Crisis Management eLearning courses which complement the above course. 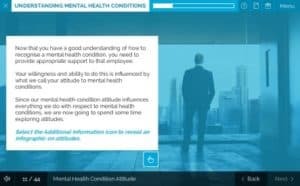 An interesting and relevant eLearning course for all level of employees to increase their awareness of mental health conditions and help reduce the stigma associated with mental health conditions. The course is designed to help all individuals within your organisation to understand mental health conditions and their role and responsibility with respect to mental health conditions in the workplace. 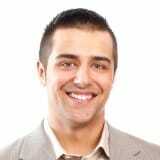 Office-based, onsite or mobile employees, consultants, contractors or team members at all levels within your business. The purpose of this course is to provide your employees with the knowledge, skills, and tools to recognise mental health conditions, and understand their role and responsibilities with respect to mental health conditions. The course content includes information to improve mental health condition literacy, encourage helpful attitudes and behaviours towards colleagues with a mental health condition, knowing how to recognise the signs and symptoms of the most common mental health conditions, and understand their rights and responsibilities including the law and mental health conditions. A 30 minute eLearning course containing interactive content and activities, animations, videos, and includes a comprehensive eToolkit containing additional resources for your organisation and leaders to use after completing the course. Each participant receives a digital certificate signed by a registered psychologist upon course completion. You may also be interested in viewing our Mental Health Awareness – Leaders and Mental Health Crisis Management eLearning courses which complement the above course. Designed for all levels of your organisation, this essential bespoke eLearning course provides the knowledge, skills and tools for your leaders and employees to provide immediate first responder support needed for an adult experiencing a significant mental health event crisis. Office-based, onsite or mobile leaders and employees, consultants, contractors or team members at all levels within your business. The purpose of this course is to give your leaders and employees the knowledge and skills to provide the most helpful immediate support and course of action in providing first aid in a mental health crisis. The course content includes how to recognise and manage a mental health crisis, addresses the most likely mental health crisis an employee may encounter such as psychosis, suicidal ideation, self-harm, panic attacks, aggression and trauma, as well as information on how to get help and how to self-care after being a “first responder”. 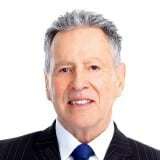 You may also be interested in our Mental Health Awareness – Leaders and Mental Health Awareness – Employees eLearning courses which complement the above course. 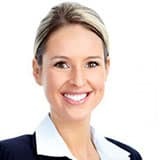 A fascinating bespoke eLearning course for the leaders of your organisation designed to provide participants with the knowledge, skills and tools to build their personal psychological resilience capacity and influence the resilience of their team members. Resilience is a skill that can be learned to help individuals deal more effectively with the challenges, change and adversity of life. The purpose of this course is to provide your leaders with the knowledge, skills and tools to build their personal resilience, improve their stress management skills and influence the resilience of others. 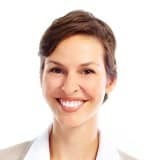 The course content includes an overview of the traits of resilient individuals and how to personally develop these skills, the neuroscience and psychology of stress and resilience, and how to increase the level of resilience in others. A 45 minute eLearning course containing interactive content and activities, animations, videos, and includes a comprehensive eToolkit containing additional resources for your organisation and leaders to use after completing the course. Each participant receives a digital certificate signed by a registered psychologist upon course completion. You may also be interested in viewing our Mental Health Awareness and Wellbeing eLearning courses which complement the above course. A thought-provoking bespoke eLearning course for employees of an organisation designed to provide participants with the knowledge, skills and tools to build their personal psychological resilience. Resilience is a skill that can be learned to help individuals deal more effectively with the challenges, change and adversity of life. All office based, onsite or mobile employees, consultants, contractors or team members at all levels within your business. The purpose of this course is to provide your employees with the knowledge, skills and tools to build their personal psychological resilience and improve their stress management skills to overcome life’s challenges. The course content includes an overview of the traits of resilient individuals, how to personally develop these skills, the neuroscience and psychology of stress and resilience, and developing a personal action plan for increasing personal levels of resilience. A highly motivating bespoke eLearning course for all levels of your organisation designed to provide your employees with the knowledge, skills and tools to improve their overall wellbeing. All office-based, onsite or mobile leaders and employees, consultants, contractors or team members at all levels within your business. The purpose of this course is to provide your leaders and employees with knowledge and skills to proactively engage with and improve their wellbeing. The course content includes a personal wellbeing assessment, the neuroscience and psychology of wellbeing, learning the evidence-based habits of happy and healthy people, having an opportunity to set some wellbeing goals, and understanding how to establish and stick to some new wellbeing habits. You may also be interested in our Resilience – Leaders and Resilience – Employees eLearning courses which complement the above course. All of our eLearning courses can be partly or fully customised. 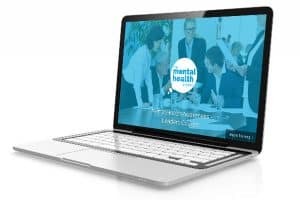 The Mental Health Project can also be engaged to design and develop an incredible custom built mental health, resilience or wellbeing eLearning course for your business. Do you require a custom built mental health or wellbeing eLearning course? Our team of psychologists, learning and development experts, and leadership specialists can design, develop and build a highly engaging, innovative and evidence-based custom-built mental health or wellbeing eLearning course for you that will meet your learning and organisational objectives. Give us a call to discuss your requirements, we´d love to work with you. No boring eLearning courses here! Our eLearning courses feature interesting content, cool graphics, are highly interactive, and use multimedia such as videos and animations. Our courses are all designed to capture your employee’s attention and keep them engaged for the duration of the course. Geeks at heart, we keep up with all the latest quality research and reports! This means our eLearning courses are relevant and up-to-date with the most current science and workplace health and safety legislation. 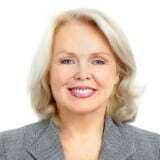 Our evidence-based courses are written and developed by expert psychologists and learning and development specialists. Partly or fully customise our courses with your logo, branding, content to include existing processes and initiatives, or translate and localise to your requirements. We can also custom build mental health and wellbeing eLearning courses to meet your organisational learning and cultural change objectives. Being SCORM compliant our eLearning courses can be hosted on your internal SCORM compliant Learning Management System or hosted on our LMS. Our LMS is very user friendly and includes training for your administrators, premium technical support, and has all the features you need to report, track and manage your training across your organisation, multiple sites or even multiple organisations. Using the latest eLearning tools and technologies means our eLearning courses have a responsive design and work on PCs, Macs, iPads and tablets giving your employees flexibility to complete our courses at work, on site, on the go, or from home. Cleverly designed, each course can be used as a core corporate training module (to replace face-to-face training), integrated into your inductions, as a refresher (following face-to-face training), or for your remote or dispersed mental health and wellbeing training needs. Suitable for the smallest local, to the largest global organisation, our courses and LMS is fully scalable to meet all your training requirements nationally and internationally. 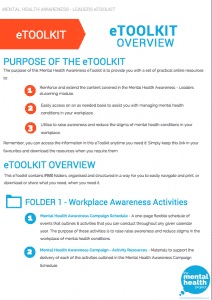 A comprehensive eToolkit accompanies each eLearning course and contains additional resources such as mental health and wellbeing factsheets, tip sheets, a calendar of activities, posters, and videos and animations to help you refresh and implement the course content into your workplace. Our eToolkits can also be customised, translated and localised to your local requirements. Our eLearning courses are a high quality, time efficient and affordable training option. Our dedication to giving you an exceptional customer service experience, combined with our simple 7 step implementation process, training, technical and practical support, means this will be one of the easiest training courses you have ever implemented. Each eToolkit typically contains a schedule of activities that your managers or HR/HSE department can conduct throughout any given calendar year along with factsheets, tip sheets, posters and videos to refresh and build on the content covered in the eLearning module and for sharing with employees. 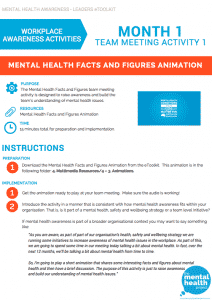 An example of use may be a manager using the factsheets and tip sheets to refresh on the main concepts of a mental health condition before having a conversation with an employee who they may suspect is suffering from a mental health condition, or the posters could be used to help raise awareness of mental health or wellbeing during an allocated week in the year. All eToolkits can be customised, translated or localised according to your requirements. Being SCORM compliant, our eLearning courses can be hosted on your organisation´s SCORM compliant Learning Management System (LMS) or if you don´t have an LMS, on our very user friendly corporate LMS platform. Once established, you can also use the LMS to host other third party SCORM compliant eLearning modules thereby giving you one central learning and training platform for your organisation. We aim to give you an exceptional experience and make the implementation of our eLearning courses as easy as possible for you. We follow a 7 step implementation process designed to get your eLearning courses up and running quickly and smoothly. You decide the eLearning course(s) you need. Receive a fast quote from us. We develop your partially or fully customised course if required. Your course is uploaded on the agreed platform. Your employees receive and invitation and complete the course. You track, report and manage as required. We are always here to support you along the way! You embed and refresh the concepts from the course into your business using the eToolkit. Our LMS hosting option includes a range of features including ongoing technical support and branding so it looks like your own LMS. View the full range of our LMS features. Our eLearning courses are affordable, scalable and licensed to organisations on a yearly, per user basis either locally, nationally or internationally. All courses include our comprehensive eToolkit and can be purchased as a standard version or customised for an additional fee. Hosting on our LMS can also be included if required. How do I purchase the eLearning courses for my business? Our eLearning courses are licensed to organisations on a per user basis and are purchased from us directly. All of our courses can be purchased as standard versions or customisations can be applied for an additional fee. Contact us to find out more or view a demonstration. We´d love to help you with your mental health and wellbeing training requirements. Can the eLearning courses be used as a replacement for face-to-face mental health and wellbeing training? Absolutely – our eLearning courses have specifically been designed to provide organisations with a fully comprehensive cost effective and time efficient alternative to face-to-face training. 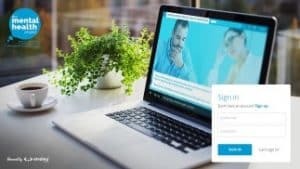 Recent research has found that eLearning is ideal for mental health education as it provides a confidential and private learning environment on this often sensitive and confronting topic. Where are the eLearning courses hosted? All of our eLearning courses are SCORM compliant and can either be hosted on your company´s internal SCORM compliant Learning Management System (LMS) or on our very user friendly corporate LMS platform. Learn more about our LMS. 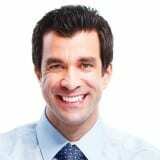 Do the eLearning courses help me meet my legal responsibilities to provide a psychologically healthy and safe workplace according to your relevant workplace health and safety legislation? Yes – our eLearning courses have been designed to assist you to meet your legal responsibilities to provide a psychologically healthy and safe workplace according to relevant legislation. Additional mental health and wellbeing strategies and initiatives should also be considered to apply, complement and extend on the content covered in the eLearning courses. 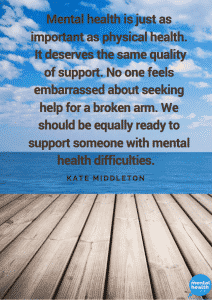 We would love to hear from you and find out how we can help you with your mental health and wellbeing eLearning requirements. Connect with us via phone or email so we can discuss your needs further and provide you with a no cost initial consultation and course demonstration either at your office or online.